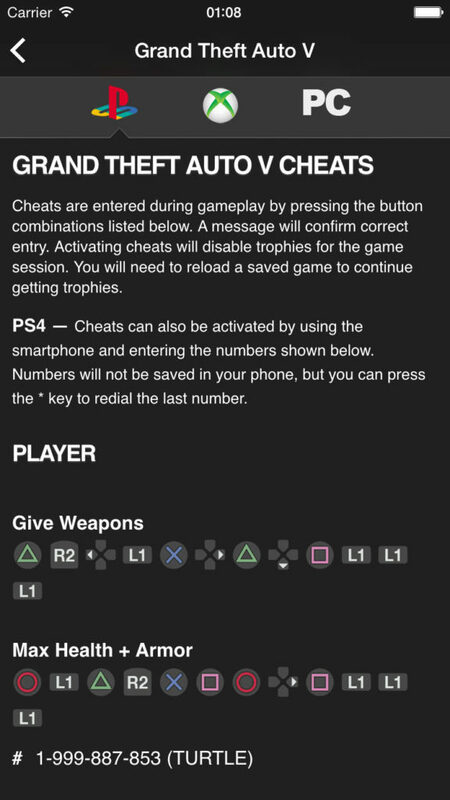 Cheats for GTA is an app that provides simple, quick and easy access to every cheat code for every Grand Theft Auto game on all platforms. It’s available for iOS, Android, Amazon, Windows Phone and Windows 8.1+. Cheats for every GTA game. 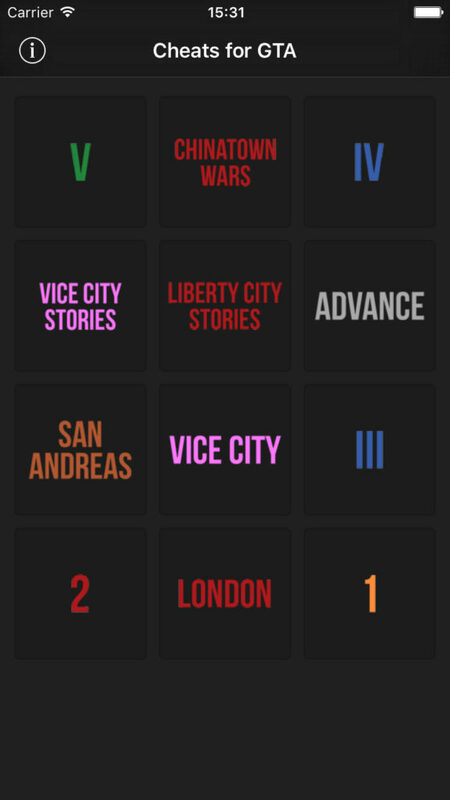 Cheat listings for each version of each game. iOS, Android, Windows and Amazon. Step 1: Tap a game’s logo to see all its cheats. That’s it! There are no more steps. 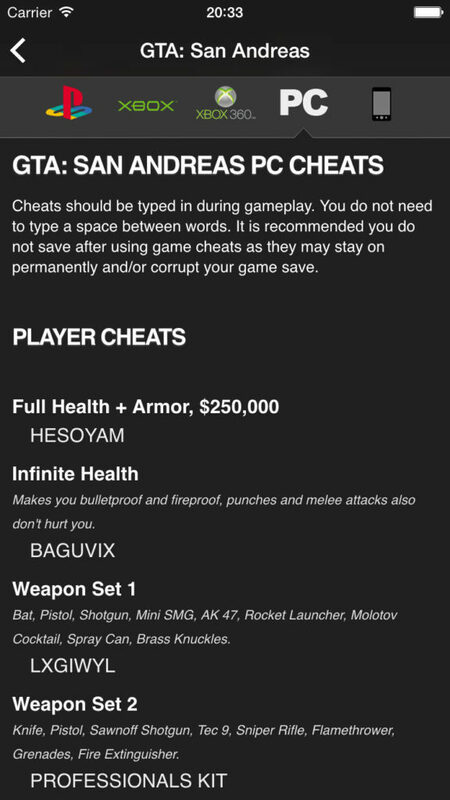 The list of cheats is right at your fingertips. You can easily change which console you’re viewing cheats for. There’s no annoying obstructive ads to sit through. No other distractions. You don’t even need an internet connection for the app to work. Does it really have cheats for every GTA game? NOTE: There are two exceptions; the iOS and Windows Phone versions of GTA III, Vice City, and San Andreas – these games use the PC cheats but there is currently no way to enter them in the game. On Android versions of those games, the PC cheats can be entered if you have a USB keyboard connected. Is this app really free? Yes. It wouldn’t be fair to make people pay for access to the cheats, after all, you could just spend time searching the Internet for them to get them for free. App development is a job though, and we have to make money somehow, so that is why the app is ad-supported. Ads are as unobtrusive as possible; just a simple banner at the bottom of the page. If you appreciate the convenience the app provides, or just want to get the ads removed, you may choose to pay a very small fee to remove the ads permanently. NOTE: In-app purchases (IAP) are not currently available in the version from Amazon’s Appstore. My device is in English, can I use the app in a different language? Absolutely. As of version 2.1.10 you can override your device’s language and use the app in any language we support. iOS and Android: Tap the icon at the top left of the main page and then tap the “Language” button. Windows Phone: Tap the icon at the bottom of the main page and then swipe right to the “Language” page. Windows 8.1/10: Click on the icon at the top left of the menu bar and click on “Settings” to open the settings flyout, then click on “Language” link. Can I help translate into my language? 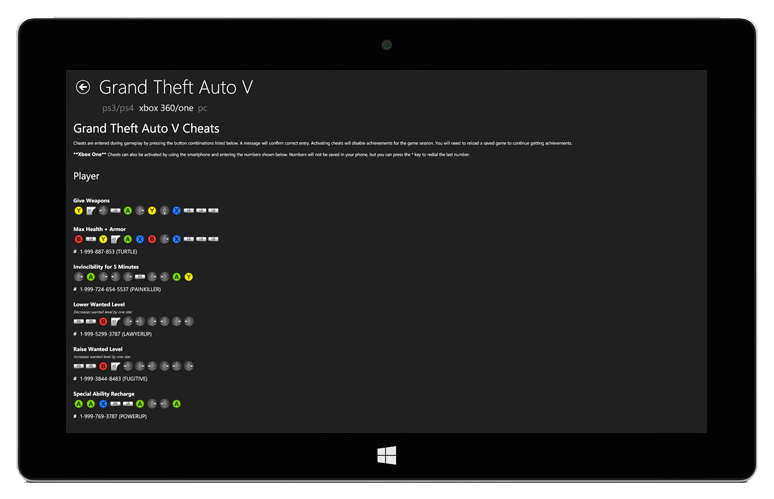 Users of Cheats for GTA have shown incredible enthusiasm and support for making the app available in many languages. If you’d like to help out, follow the steps below. Head over to translate.midnightlabs.uk; this is our translation website hosted by OneSky. If you don’t already have an account, follow the link to sign up. Scroll down to the Cheats for GTA project, you should see there are 2 sections – one is the App Store description, the other contains all the words and phrases in the app itself (both will need to be fully translated before we can include it in the app). Find the language you want to contribute to and click on it. You should see several pages of phrases with English on the left, and a box on the right for you to type in the translation. You may see some have already been completed by another translator. This is fine, you can upvote if you agree with their translation, or correct it if you feel it is wrong. If the box is empty, you can type in the translation and press TAB to save it and move on to the next one. Please ensure you use the correct spelling, proper capitalisation, and include any accents or diacritic marks on letters. Feel free to skip anything you’re not sure about – you can translate as much or as little as you like – we seriously appreciate all the help we receive, and so do the users of the app! Please note that any translations you provide will be done so on a purely voluntary basis, though usernames of those who contribute large amounts will be credited within the app.